Clearwater Beach has so many ways to get out onto the water it can boggle the mind. While they are abundantly available, they are not, however, all ready for children. We would like to lend parents a hand finding some kid friendly boating options. Clearwater has plenty of those too. Walking down the Clearwater Beach Marina line up will provide lots of options. Most tour boats are fine to take kids on, although some include a little more alcohol than parents tend to tolerate around their kids. Be sure to ask if you are about to embark on a booze cruise. Some tours designed with kids in mind are Captain Memo’s pirate cruise ship and the Megabite. Both have designs that the young ones love. Captain Memo is a bright red pirate ship with a pirate’s crew while Megabite is sculpted to look like a giant shark. Both vessels are fun and both will attempt to give their passengers a dolphin sighting. The super speed boats named Sea Screamer and Thiller are hits with the kids, both boats hitting high speeds once they reach open waters. They are also considered dolphin viewing tours. Dolphin sighting tour boats are popular in the Clearwater area and the Clearwater Beach Marina has lots of them. Just pick your favorite boat or the one that suits your family best. 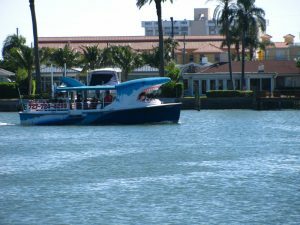 Themed boats don’t always track the dolphins but dedicated dolphin touring boats will, so choose your boat ride accordingly. Of course, you should always ask the crew what they intend to do on your particular cruise. The captain will have a say in what the tour includes and will sometimes alter the activities based on the wants of the passengers. Renting a boat for your family is an option also. Mom or dad should have some boating experience for that one. Parenting while learning to drive a boat might not be a good mix on active waterways like ours. If you are comfortable on the water, you will find a number of boat rental outlets and types of boats to rent. Kayaks and paddle boards are yet another way to get out on the water. You can decide if the slow moving craft are right for your family and its age groups. Having mom and dad each take one of the kids on board is a fun way to go. Ask the person you are renting from where the best place is for your family to kayak. If you’re not satisfied with the answer, look up another craft rental spot on the island. 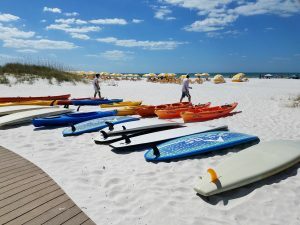 Clearwater Beach has a few coves and safer places to paddle. Steer clear of the marina with those smaller craft. Just to the south of the island of Clearwater Beach is the Clearwater Community Sailing Center. They include sailboats among their rentals for those who know how to sail. They also offer sailing lessons. 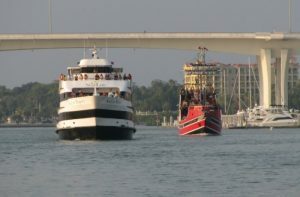 One last boat tour that is very worthy of mention is the one offered by the Clearwater Marina Aquarium. The CMA is home to the celebrity dolphins Winter and Hope, the stars of the Dolphin Tale movies. In addition to the Dolphin Tale museum in downtown Clearwater and the marine aquarium on Island Estates, the CMA also has marine biology boat tours. They are fun and informative tours of the harbor designed just for kids. And, yes, they are entertaining for adults too. They guided boat ride includes scooping up marine life with a net and showing it to the kids before setting the creatures free again. Fish, seahorses, crabs, and other interesting wildlife are caught and displayed. This ride gets good reviews and the kids love it. Getting out on the water is a perfect way to make the most of a Clearwater Beach vacation. On-the-water is where the dolphin sightings occur most and Clearwater Harbor and Gulf of Mexico are beautiful. If you are bringing the kids along for a family vacation, be sure to check out one of the options above.